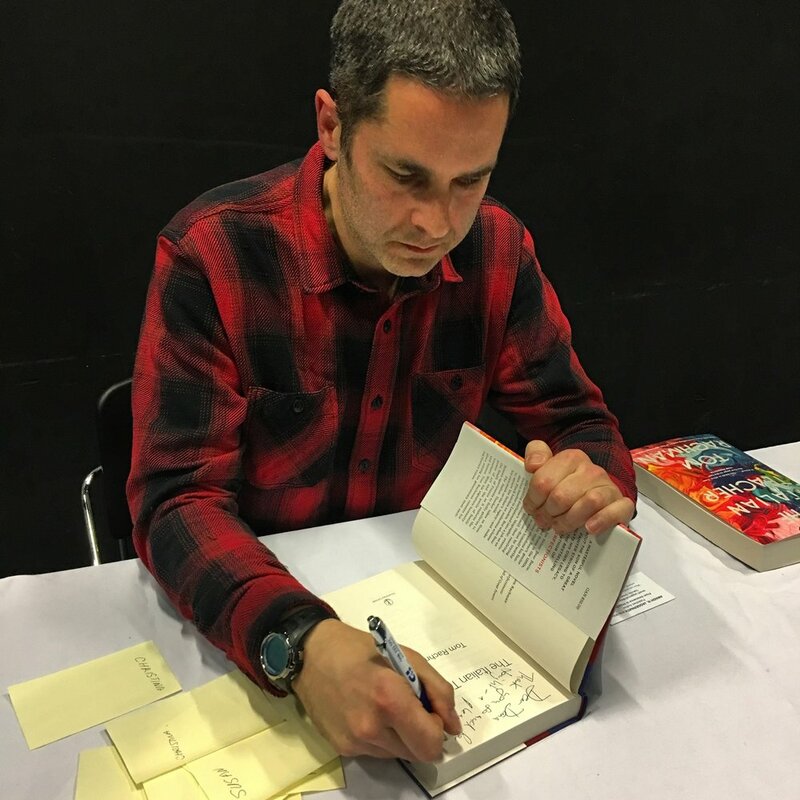 On March 18, 2018, A Different Drummer Books and the Oakville Public Library hosted an afternoon with bestselling writer Tom Rachman, author of The Imperfectionists (2010), The Rise and Fall of Great Powers (2014) and his new novel, The Italian Teacher (2018). Rachman, a former journalist who was raised in Vancouver and now lives in London with his wife and son, read to the audience from the opening pages of The Italian Teacher and talked with me about what prompted him to write his latest work. What follows is a condensed and edited version of the event. Dana Hansen: I want to talk a little bit first, Tom, about the essay you published recently in The Globe And Mail. It was called “Shakespeare’s Children: Should Artists Have Kids?” The essay basically tells about your concerns a few years ago, as you were approaching fatherhood, with the cost of the creative life for children of artists. I wonder if you could tell us a little bit more about that, and why you decided to explore these concerns through the story of an artist and the son who lives in his shadow in The Italian Teacher. 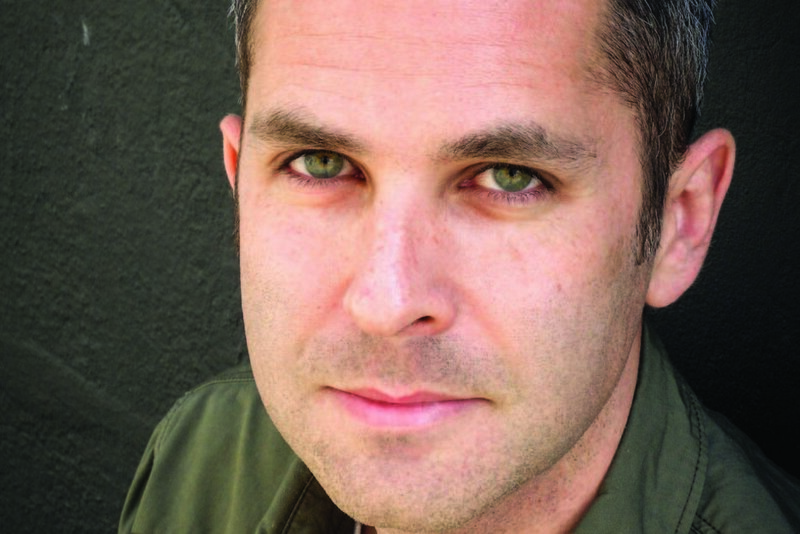 Tom Rachman: I was always very interested in the lives of artists and anybody who has looked at them, read stories, heard anecdotes, knows that these lives are often chaotic and quite awful for those around the artistic person. I was coming to an age where I felt that if I was going to have children at all, I should probably get on with it, and I had spent my twenties and thirties devoting myself entirely to trying to gain some traction in writing, which was difficult to do and was a lot of work and required a great deal of dedication to that and sacrifice to pull that off; and it occurred to me that sacrifice and dedication were precisely what were required to be a decent parent as well. I found myself in a bit of a dilemma, unsure whether I should risk having a child who could damage my prospect as a writer, or far worse than that, risk damaging a child by being a writer. And so I think that I wanted to try to figure this out by writing a book, not just a book that dealt with some of these things, but a book in which a central character is this painter who is extremely driven but also cold and callous and ruthless, and felt to me like the very worst iteration of this sort of person, like the kind of nightmare I could become, and I wanted to see what that would look like. I wrote the book, however, from the perspective not of him but the perspective of the child, and to try to get a sense of what that would really look like and to force myself to think hard about the cost of this kind of behaviour for those around you. I think one of the wonderful things about fiction for me, both as a reader and a writer, is that you find yourself trying or able to gain some degree of access to others’ experience, and this was a way for me to try to think about this in a more real way rather than just a notional way. And so I wrote it partly for that reason, and also because I wanted to explore elements of the artistic life that I felt were misunderstood in the world and the culture. So it was partly personal, and partly because the arts and the people in them are a longstanding fascination of mine. DH: Why did you decide to set the story in the second half of the 20th century — why particularly the post-war modernist period? TR: I think that the post-war period, probably the 20th century to the late 20th century, let’s say, was a very interesting period for visual art in that there was amazing tumult and change at a very, very fast pace, so that there were movements that were intense and powerful and affected everything, and then they were overthrown within ten years or so. Moving up to a point probably in the 1960s, or 70s, or even 80s, when for complicated reasons that kind of stopped; and it’s not that it stopped, it’s that the art world just kind of fragmented entirely so that there is no singular movement as there were in earlier periods. So, after revolutions and counter-revolutions on and on, it kind of exploded at a certain point. Up until that point, it was a period of quite extraordinary and radical change and I felt like it would be an interesting backdrop to the human stories, to have the tale of the culture changing at such an amazing pace in the background. This was particularly pertinent as well to the main artist character Bear, who is at a certain point a great and important artist, and at another stage is struggling to cling to that kind of status. DH: The depiction of the art world, especially in New York, the dealers, the gallery owners, the collectors, is not always very flattering. They come across in some cases as being a little, perhaps vapid, as fawning over the artists, and maybe easily duped. Did you know a lot about the art world and the sort of people who populate that sphere before you wrote the book, or did you do a fair bit of research? Did you visit some of these places? TR: I didn’t know tons about it before, but I knew a lot about the literary world, and that was a useful background, but I did a lot of research for the book, yes. I always hope that the setting that I write about will feel authentic to the people who really know it. For that reason I always talk to people, and I have a past in journalism and I used some of those reportorial practices to try to gather the specific details and ensure that even the small things are as true to life as I can make them. I spoke to a lot of artists who were very successful, others who were just labouring on the margins without any success which perhaps they deserved but were unlikely ever to get; I wanted to hear about that kind of experience, too. I studied painting and drawing and pottery – I don’t want to suggest that I did huge long courses in this, I did courses in it but not for years and years. I just wanted to familiarize myself with the techniques to some degree so that I could write in a more realistic way. And I read a large number of biographical accounts of the artists, and that was kind of harrowing reading actually. TR: In the sense that, while it’s not universally true that artists are abysmal to people around them, there is quite a lot of that. There does seem to be a consistent theme, and it made me wonder about that, about this question of to be great in the arts do you have to be awful as a human? And the book is kind of asking that question, and I have some thoughts about that, but I don’t have a definitive answer. I think that one possible partial explanation of it is that the arts are extremely competitive; at the top level they are one of the most competitive fields in the world. You have millions of people striving to do this, of whom a few thousand will be able to support themselves, of whom probably fewer than a dozen per generation will actually gain the sort of recognition that they’re all striving for. And in any field that is intensely competitive like that, there are a few things that can be helpful. Number one, if you are an unbelievable genius, which is pretty rare; and another if you are ruthless. And I think that if you look at lots of different fields —business, or the sciences, or academia — you’ll find that in the more competitive areas, the extraordinary talents and the extraordinarily ruthless often manage to do quite well, and if you can combine those two traits, then you’re set. But it doesn’t mean that those people are necessarily going to be particularly savoury human beings. What’s different about the arts, though, is that there are these longstanding myths around artists that have permitted that kind of behaviour, which is obviously something that has been challenged over the last year or so, but it’s something that we haven’t challenged or considered for a long period, and I don’t have an answer whether it should be allowed or not. But we have collectively decided that that is part of what being an artist is, that you get to be completely irresponsible and crazed, and I think we even rather enjoy some of these stories of these wild characters that are sort of living these lives of debauchery and unconventionality that are exciting to look at from a distance. TR: Well, I don’t say you have to. I really was asking the question. I think that there are some important counter-examples. There are some very nice human beings who are very, very good artists. Off the top of my head, the person who won the Nobel Prize for literature this year, Kazuo Ishiguro, is a superb writer I think, and he is renowned in the industry for being a lovely human being. So it’s not universally true that that is the case, but I think that for the reasons that I was suggesting, sometimes for those people who are viciously focused on their own advancement, it can work, just that it can degrade their soul to a degree that they’re not very likeable in any other regard. DH: So is Bear Bavinsky the worst of people? Is he the worst of fathers? Can you tell us a little bit about him? TR: I think there are definitely worse than him, but he’s a very damaging, wounding example of it. He’s a 20th century painter who is known for these huge canvasses that are expressionist canvases – paint that is spewn across these huge fields, and very brightly coloured and very intense. They’re portraits, however, portraits of a person in magnified detail, and he’s known for a passionate charismatic personality and character that matches his painting; he’s a very charming man, he’s a man who people gather around if he’s at a party, and he’s also kind of a big, brawny, bearded man. And he’s totally irresponsible in his personal life. He tries to make all the people around him into personal assistants in a way, so with all of his various wives and lovers, he intends to render some kind of service from them in the attainment of his glory. And his son, Pinch, has a special role in his life, because Pinch seems to be the most loyal and obedient, until at a certain point, Pinch does something that changes the whole story for everyone. DH: Bear does seem to get kind of a pass from a lot of the people around him, people who just seem to accept that this is the way he is, and you mentioned his irresponsibility with his family members. We find out that he actually has multiple affairs and marriages. He has seventeen children as a result. Pinch’s mother Natalie, we come to understand, has plenty of reason to be resentful of Bear and his behaviour, but even she says, “you need to be selfish as an artist.” She adds, however, that this is something that women artists cannot do as well. Was it important to the story that Natalie also be an artist herself? TR: It was very important for me, to the story, that there be that dynamic, because one of the questions the book is asking is: is there justice in terms of art, and what we deem artistically great? Because I think that, without conceiving of it in that way, we usually assume that that is so. There’s a general sense that the people who are famous and successful in the arts now may have gotten there via corruption and it might be unfair; but in the long run, a few generations from now, there’s a kind of magical sifting process – I think of this as typified by the Van Gogh ideal that in his lifetime, he painted all these paintings, sold only one, and died in poverty and shot himself in the heart, and it was a miserable sad story, but afterwards he’s recognized as one of the greats of all time. And we have taken from that kind of a tale that in the end the greats are recognized despite the injury that they suffer in life. I tend to think that’s not true, I tend to think that there is another way to interpret that story: that there are hundreds or thousands of Van Goghs who just vanished into nothingness; they followed a similar path, died, and nobody ever knew anything of them, because the ways that artistic greatness is usually determined, if you’re a visual artist let’s say, is getting into important collections, and getting those placed in important museums and so forth. In your own lifetime you may be excluded from that for some reason, because you’re born in the wrong place, you don’t have the right personality, because you’re a woman in a time when people want male, meaty, muscular artists. Natalie is a ceramic artist, and it always struck me as a bit bizarre that painting and sculpture is where real art happens, supposedly, but if you do ceramics, it’s not really considered art – do you know any ceramicists? I’m sure you don’t, but you probably know a hundred painters and sculptors easily. And so there are all these arbitrary rules that end up determining what we as a society consider great, and I wanted to pose these three characters in different forms of opposition. You have Bear, who is supposedly the great artist; you have his wife, who probably has at least the potential to be as great if not a greater artist than her husband but is shunted aside throughout her life and throughout her career; and their son who is caught between longing to somehow match the fame and renown of his father, but recognizing with great unease that he’s probably more, in himself, in his personality, like his mother. And so I hoped that through telling those stories, I would encourage the reader to question some of their sense and understanding of what it is that we decide is great in the arts. DH: Pinch’s constant need of approval from his father seems to render him incapable of connecting meaningfully to other people. Looking back on his youth as an older man, he realizes that he “considered human connections the refuge of those who couldn’t make art.” Can you tell us about Pinch and what happens to him over the course of the novel as a result of the example of Bear and his relationship with his famous father? TR: I think that he’s a character, a person, who is in a great deal of difficulty at many points in the book, and a large part of that I think I could refer back to what I said before about his being caught between these two poles of trying to be one person but really being more like the other. As a result it takes a long time for him to come to terms with his own nature, his own personality and identity, because he’s fighting so desperately to remake himself into a different person. And the outcome is quite a lonely life in many stages. I do view him as a more sympathetic character, I certainly wouldn’t put him on the same level as Bear — I think that for me he is somebody who is awfully deformed by the way that he is raised, by being a quite sensitive young person who sees the world drawn to a certain sort of the thing, and thinks that presumably is what I must aspire to, but it’s not at all his nature to be that kind of person. And that statement that he says about those who seek to make human connections are those who can’t make art is him in a way trying to absorb and adopt the way that his father lives. In fact he tries to follow exactly that sort of principle, and ends up suffering a very hard life for considerable parts of the book until he finally resolves this; and he resolves this in ways that I won’t give away, but he finds a way around this finally, and I would say comes to terms with himself. The title “The Italian Teacher” is meant somewhat ironically. He works teaching Italian because he grew up in Italy, and he has that skill, but he sort of falls into it, and he’s always longing to be something more than his professional title until later in the book when he recognizes that he has a different interpretation of that, and settles into being the Italian teacher because there is much more to him, even if it’s not publicly recognized. DH: In his struggle to be something more, to achieve approval from his father, and to become something that he thinks he should be, he seems to do harm other people. Can you talk about his relationships to others in his life, perhaps with Cilla Barrows? TR: He does harm other people, but I think that equally he’s sort of bypassed by other people. I think that in some cases, he gets it wrong, and there’s a certain period, especially when he’s younger, where he’s torn because he’s starting to make really close connections with people, but he’s not really sure how to respond because the only way you can really connect with somebody is if they are seeing the actual you and appreciate that in some way, and you’re comfortable enough to behave as you naturally would around them. So by making those connections he’s sort of exposed a bit because he doesn’t necessarily want to be the person that he is. He would like to be recognized and seen as somebody he doesn’t have the ability to be, and as a result he sort of turns away from people who are close to him, who later come back in different ways into his life at a later stage when they’ve changed, and he’s changed, and both sides see it very differently. I think that it’s also the case that because of this weakness that he has, other people move beyond him. In the case of Barrows – a woman he’s seeing when he’s at the University of Toronto – she is an exceptionally talented art history student, and he’s besotted with her, but he also sees her in a different way. He has an emotional connection to her, but he also feels that she has such propulsion and such intellectual power behind her that perhaps she will be the compensation for his own weaknesses. So he sort of wants to hang onto her as she takes off into orbit. But nobody who has that kind of talent and ability necessarily wants somebody hanging onto their coat. So they have their problems, in particular the way those problems end up manifesting is through the dangerous intercession of Bear, the father, who is such a vortex that once he comes into the picture, big problems ensue. DH: Again, that’s because Pinch is always looking for ways to please Bear, and so he gives up certain things in his life or he bypasses them. TR: I think that Pinch is pulled between these two power sources — there’s the one who’s the father that he’s always trying to impress, and on the other hand there’s the woman he wants to persuade to stay with him. And so his ability to appeal to either of them is split in half, and it ends up causing trouble. DH: When Pinch realizes that art is not necessarily going to be his path, that he’s not necessarily going to be an artist, what does he decide he’s going to do? What is his goal, and how does it involve Bear? TR: Well, I think he goes through several different stages. There are periods with Bear, where early on he wants to be as great as Bear, and then he realizes that perhaps his role is to be the most important confidante and the most important assistant to his father, and to further his father’s career, to be the son who ensures that his father enters the annals of the greats of art. Particularly when Bear is facing the threat of the changing art world, the changing tastes, then Pinch wants to somehow gain or retain that special place with his father by breaking into the art world and carving out a special place for his father inside it. And then as the years go on, I think that Pinch is struggling with all sorts of different personal situations, and begins to wonder about what he gets out of this relationship with his father, leading to some fireworks. DH: Without giving away what happens in the latter part of the book, essentially Pinch does manage in kind of an unusual way to make a name of sorts for himself in the art world. And it could be perceived in the end that he, as the son, is triumphing over the father. Did you view it that way? Did you think that Pinch is triumphant in the end? TR: I think he does something better than triumphing, which is that he decides that this is not a competition and not a contest that he cares to be involved in anymore, and that he has a completely different understanding of his experience of life: that the violent competition for greatness in the arts that he’s either attempting to achieve for himself or manage for his father is something that is empty to him, and he finds another way to be. DH: You referenced earlier the myths surrounding artists. I think in some ways the book is entirely about these myths, it addresses them at many levels. Someone like Bear is perceived as being an artist for art’s sake, a purist. He’s committed solely to his artistic vision, he doesn’t care about money or the opinion of others. And this comes up at the end of the book – it’s actually a retrospective of Bear’s work in 2018 – when Pinch’s friend Marsden says he wonders why these myths are still perpetuated about artists, because we learn that really this is not true of Bear. He is actually quite interested in people’s opinions. Why did you want to address these kinds of myths in this book? TR: Well, I suppose because I grew up being really fascinated with the lives of artistic people, and then I ended up working in the arts and I realized that a lot of these myths that I had completely bought into were untrue, and that there was a huge amount of nonsense that everybody is party to, that is perpetuated by the industries of culture because they stand to gain a great deal by having heroic figures to sell. It’s also perpetuated by the artists because it’s very flattering if you are a great Bear Bavinsky and people come up to you and recognize you and confer a great deal of status onto, which hasn’t by any means always been the story for artists historically. A long time ago artists were viewed as very lowly sorts of craftsmen. Artists today who are viewed as having such a high role in society – why would they want to lose that? Why would they want to return to obscurity? And then I think as well, the public, we’re all complicit in it, because there’s something titillating and exciting about feeling that you’re not just looking at a painting, but you’re looking at something with a whole complex and perhaps troubling story behind it. It does make the art more enticing and exciting to have a tale behind it. So I think that as a result of all this, there’s a kind of unspoken conspiracy to maintain a lot of things that aren’t true, among them the thing that you’re citing, this idea of art for art’s sake. I’m sure that there are a tiny number of artists who produce art that way, but art is an extremely difficult thing to pull off a career in. Why would anybody try to do that if they didn’t care about communicating to others in some way? This idea that ‘well I’m just doing it for myself’ – well then why do you show your things? Why not just do it and go do whatever else you like in your life? Because the chance that you’re going to be able to really support yourself off this is very, very slim, and you only know that after having done it for a number of years. So clearly there’s something else besides just the art for art’s sake. You want to express something and that’s a perfectly reasonable thing to do. But I think that this myth that the artist is indifferent to the opinions of the public, it’s kind of a self-serving thing. It allows them to seem these heroic kind of secular saints who aren’t bothered by worldly things, that they’re in their own vision. And I think it’s an attractive kind of nonsense. When I’m speaking of artists, it is people who work in the arts, who do creative things – musicians, sculptors, painters, writers, dancers, actors, the whole business of it – and in all of these cases, I think that what I’m saying to a greater or lesser extent applies. I wanted to address what I’ve noticed about arts in the book, but I didn’t want to do it about literature because I felt like it would be too tainted by my own experience, and it would be too hard to write without communicating my own particular gripes that would just be petty and stupid and not interesting, and also that people would furthermore interpret everything that I wrote as being some sort of revenge or some sort of response to other people in the business and it really wasn’t intended that way. It was almost a book that was written with the desire of understanding the inside of this world that I had when I was fifteen, let’s say, and fascinated by the stories of these characters and wondering what it would be really like, and so I kind of transposed a little bit of what I knew about the literary world to the art world, and then as I explained earlier, I added all sorts of research to try to make it truer to that. But there are some ways in which writers and visual artists have similar careers. There are some aspects of the two that are very similar, and some that are very different. One thing that they share is that your typical visual artist will work away for a long period of time on their pieces in private, in isolation, hoping that these are valid, that these things, their ideas, are going to get the kind of reaction that they want. And then, they’ll suddenly from that relative solitude go into a period of great exposure where they’ll have an exhibition for example, and everybody will judge them. And so they alternate these cycles of long periods of effort with short bursts of exposure, and it all adds up to a career over time. And that’s quite like being a writer as well – you’re writing novels for several years in your study, and then the book comes out and you’re suddenly sitting on a stage talking to people and things like that. So you go through these cycles, and in each case you’re trying to recalibrate the things that you’re passionate to do, with the ways to communicate these to different people, to try to find a place in the world’s attention span to fit what you want to put in, and to try to justify it as well. So there are similarities in those two worlds, but there are major differences, too. DH: Did you toil away in obscurity for a while before your big break, so to speak, with the publication of The Imperfectionists? Were you a Natalie before you were a more of a Bear? TR: Well, don’t have any illusions that I have some sort of wildly exciting life. I was reading this article the other day about Philip Roth and he was saying that the world’s most boring book would be his biography, and I sort of feel the same way because generally the life of a writer is that you’re sitting in a room with a keyboard in front of you. It’s incredibly dull. It’s fun to do, but it’s not actively interesting. I think that as a result of that, you feel like your whole existence is sort of in obscurity and you’re always hoping that the people will ultimately be interested in the things that you’re conceiving, but there’s never any guarantee, and a writing career can have moments of close attention and then long periods of total inattention. So I think that I always feel closer in most respects to Natalie than I would to Bear, and when I said before that Bear is the worst iteration of me, it wasn’t that I felt I was like him – he was the worst version I could see ever becoming, and I wanted to see what that would feel like. DH: Would you still be writing if you had not achieved a level of fame and success? If people didn’t know about your books, would you still be writing? TR: I’d be writing emails. Maybe a bit more desperate emails than right now. But I think that – it’s hard to say, I don’t really know what I’d be doing, but I think that there’s no way that I could be doing the same sort of thing because I have to be in a position to support myself and support myself somehow over several years of just working on one project. And so the process of that changes you considerably, and if it were not something that I could pull off – and who knows if I’ll be able to pull it off forever, but for the time being I can – in a world in which I was doing some other job, I’m sure I wouldn’t really have that much time to do this sort of writing. I wouldn’t be surprised if I was doing something else in writing, but just in a different way, because I’m not really good at anything else. DH: Do you feel that you accomplished what you set out to do with this book in terms of exploring your own fears about the cost of the creative life for children? T: I did, yes. It’s strange, I didn’t expect that it would really work. I just thought ‘well I’m interested in this, so we’ll see what happens’, and it was more the exercise of something that had been plaguing me for years. It wasn’t that this thing just came to me. For years I’d been really stressed about this, and worrying and wondering what I should do in my life. But yes, funnily enough, the process of writing it through seemed to help somehow. And I think another thing that helped was actually ending up having a kid; that kind of resolved the matter. And I’m very happily a father now, so I think that I’ll probably be writing less about this sort of conundrum again in the future.